Cosmetic Surgery Associates of New York PLLC (Valhalla) - Book Appointment Online! Dr. Beran utilizes his years of experience as a plastic surgeon and his willingness to adopt new technologies to achieve the best fit possible for his patients. 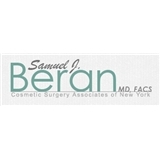 His plastic surgery offices in Westchester County and Manhattan allow Dr. Beran to meet with his patients in a private convenient setting for their plastic and cosmetic surgery consultations. Dr. Beran is on staff at White Plains Hospital, Northern Westchester Hospital, and Manhattan Eye and Ear Hospital. He performs many of his plastic surgery operations at a fully accredited outpatient plastic surgery facility in White Plains, New York. Many of our cosmetic surgery patients come from outside of the New York area, and our staff can help make travel accommodations. Always attentive, careful. Meets and exceeds my expectations.